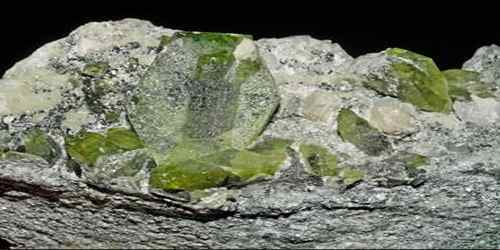 Titanite is a very rare calcium titanium silicate that is an important ore of titanium. It is also called Sphene. Its crystals are very rare, brilliant, and sparkle like diamond. 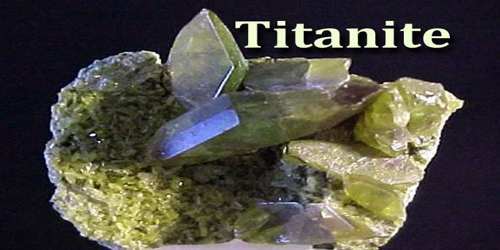 Titanite is frequently called by the name Sphene, which was the more popular term for this mineral prior to 1982. In 1982, the IMA adopted the official name as Titanite and discredited Sphene. 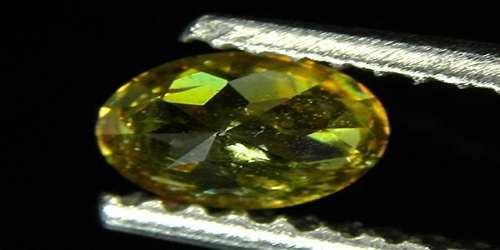 Titanite is a mineral with a hardness of 5 out of 10 on the Mohs scale of mineral hardness. These Monoclinicly structured gems are made of calcium titanium silicate, their full chemical compound being CaTiSiO5. Trace impurities of iron and aluminium are typically present. Also commonly present are rare earth metals including cerium and yttrium; calcium may be partly replaced by thorium. 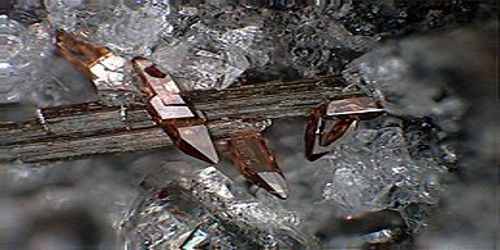 Titanite is known for its high luster and dispersion rate. This result in transparent Titanite crystals being brilliant, and opaque Titanite being highly reflective. It is also pleochroic, with different transparent crystals exhibiting different hues when viewed at different angles. Titanite is named for its titanium content. Its alternate name Sphene is named from the Greek term “sphenos”, which means wedge, in allusion to the typical wedge-shaped crystals exhibited by this mineral. These crystals are typically sphenoid in habit and are often twinned. Possessing a subadamantine tending to slightly resinous luster, titanite has a hardness of 5.5 and a weak cleavage. Its specific gravity varies between 3.52 and 3.54. Titanite’s refractive index is 1.885-1.990 to 1.915-2.050 with a strong birefringence of 0.105 to 0.135 (biaxial positive) ; under the microscope this leads to a distinctive high relief which combined with the common yellow-brown colour and lozenge-shape cross-section makes the mineral easy to identify. It is hard, heavy and has distinct cleavage. The crystals are brilliant but comparatively soft. It is transparent or translucent with adamantine to resinous luster. Some deeply colored varieties display marked trichroism, and will exude a range of colors when light is beamed on it. Other varieties of titanite/sphene may be opaque. It dissolves partially in hydrochloric acid, and completely in sulfuric acid. If hydrogen peroxide is added, the solution turns yellow (titanium). It fuses fairly easily, giving dark yellow glass. Titanite is an accessory mineral common in many acid and intermediate igneous rocks, and in gneisses, mica schists, and amphibolites. It also occurs in limestones that have had contact with magmatic rock, and in low-temperature hydrothermal veins. The largest crystals are found in rodingites and nepheline syenite pegmatites. It is also found in alluvial sand areas. It occurs in the USA in New York and New Jersey. In Italy it is also found at Alpe Devero (Domodossola), in Val Malenco (Sondrio), at Prali in Cal Germanasca (Turin), and in pyroclastic material spewed by Mount Vesuvius and the volcanoes of Lazio. Pink titanite occurs at Saint-Marcel in Val d’Aosta (Italy), associated with other manganese minerals (diopside, piedmontite, etc.) Transparent orange sphene has been found in Myanmar. The mineral is not widely used in jewellery, because the clear, green, yellow or brownish stones used as gems are rare. And because of its low hardness, it cannot take a lot of knocks, so it is usually set in earrings and pendants. The clear and attractive colored varieties have a very intense fire that displays multiple colors under direct light, and are cut as cabochons or faceted into very valuable gems, and are very popular with both collectors and scientists. Dark-colored natural stones are made lighter by heat treatment. Zoning is typical in titanite. It is prized for its exceptional dispersive power (0.051, B to G interval) which exceeds that of diamond. Jewelry use of titanite is limited, both because the stone is uncommon in gem quality and is relatively soft. Titanite can also be used as a U-Pb geochronometer, specifically in metamorphic terranes.